Repairing burned children sometimes seems like an unending task because we try to do everything that we can to equip them for long, healthy, happy and productive lives. Assistance from the Dental Department of the University of the Witwatersrand in Johannesburg has been great due to the likes of Prof Sid Setzer, Prof Peter Owen, Dr Joseph Schmaman and others, but the number of children in need of dental assistance remains high. 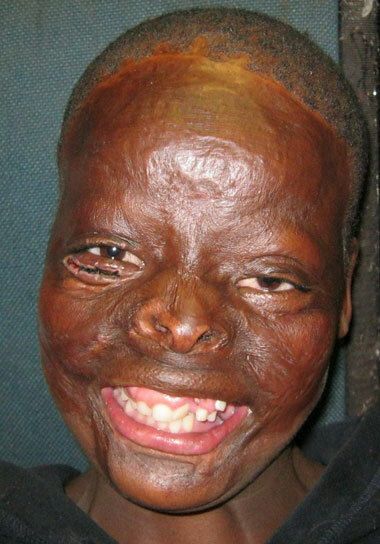 These pictures are of Anele (12) who has had facial and hairline surgery and also has a damaged hand � and who definitely needs orthodontic help as well. 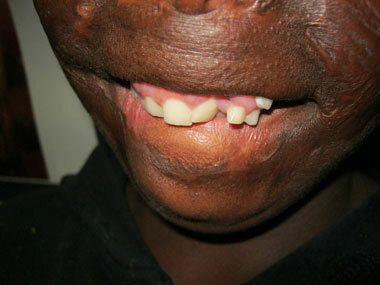 She is one of many burns survivors who present a dental challenge. Elsewhere on this website there are photos of Dorah whose mouth can never close. She has been helped a lot at Wits Dental after her lips were remade from her back, by Dr John Clarke in London, UK. 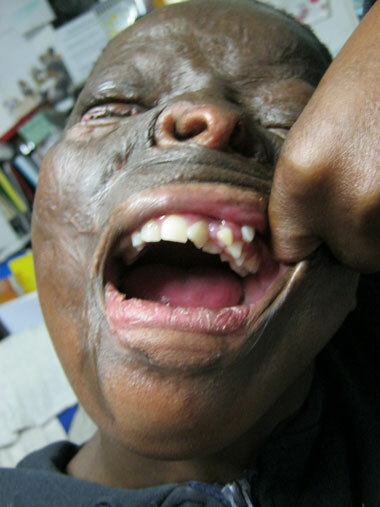 Zanele also had difficulties because of her mouth damage, and would have benefitted early on from oral splinting. Zanele, little-Bongani, Jaun, Sthabile are among many of the burned children that we have helped who had �hoarse� voices due to airway damage from burns and this often reflects in mouth injury, jaw movement restriction and more problems. Some children have been burned by swallowing battery acid, in some cases forced to do so by mentally-damaged mothers. 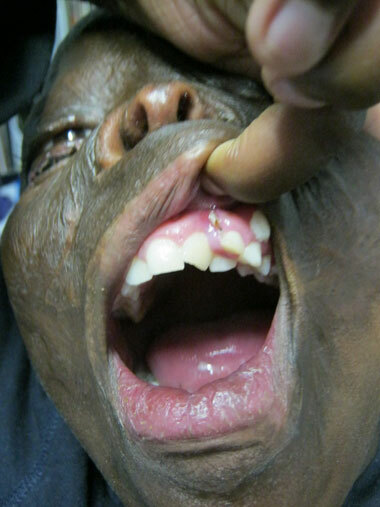 Trismus, whereby the mouth cannot open fully nor close completely, leads to above-average rates of dental decay and dental hygiene problems. It can affect speech (as with Dorah) and can lead to a child speaking very quietly (as in Zanele). Difficulties in chewing lead to insufficient nutrition � and burns survivors are usually underweight and have bone density loss, so they need their nutrition. For all head/face/neck burns, one wants the specialists involved from the outset, to give the child the best possible long term appearance and function. What we need please is for dental specialists and reconstructive surgeons to talk to each other more, not least because the maxillofacial prosthodontics expertise in false noses, false ears and false eyes is also in the hands to the dentists not in the hands of plastic surgeons.